The brand of Flatland Racing skid plates are the ultimate for protecting your fragile Husqvarna engine from nasty impacts and rocks! There are 3 different styles of skid plates for all models of Husqvarna motorcycles between the years 2003 - 2010. 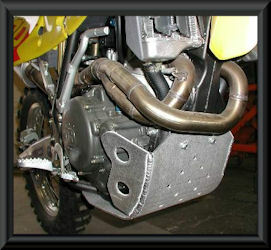 Flatland Racing skid plates are made of rugged 3/16" aluminum which feature tig welded engine guards. Installation is quick and easy with all mounting hardware included. Skid plates come with a "clean out" slot and oil plug hole, making them one of the best in the business! Plus it is a wiser choice than carbon fiber, due to lower cost and far better durability.